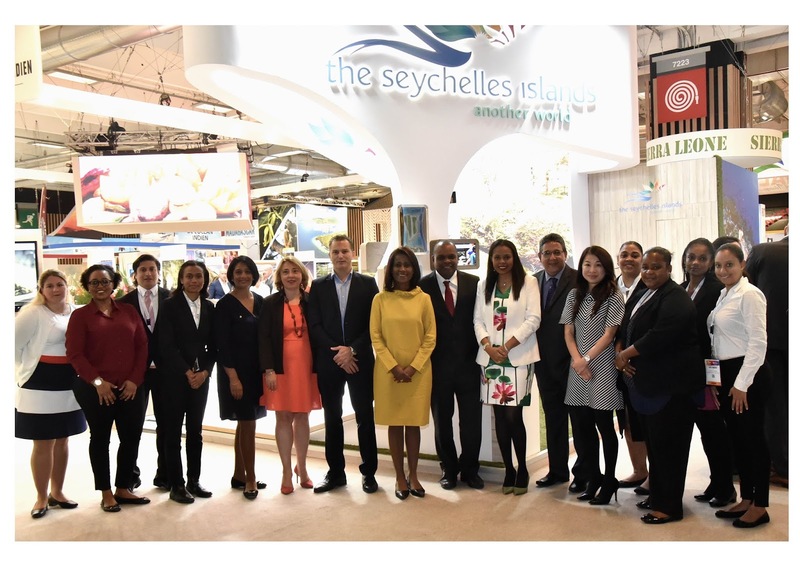 Seychelles targets increased visibility and further growing the French market as it participates in the 40th edition of the IFTM Top Resa Trade FairThe 40th Edition of IFTM Top Resa was held at the Porte de Versailles in the French capital Paris. The Minister of Tourism, Civil Aviation, Ports & Marine, Honourable Didier Dogley led the island destination’s 12-member delegation to the event. He was accompanied by Seychelles Tourism Board’s (STB) Chief Executive, Mrs Sherin Francis, Regional Director for Europe, Mrs Bernadette Willemin and the STB Marketing Executive – France & Benelux – Ms Jennifer Dupuy and Ms Myra Fanchette and Marketing Executive from the STB head office – Ms Gretel Banane. The local travel trade was represented by participants - 7 South – Ms Janet Rampal, Creole Travel Services – Mr Guillaume Albert and Ms Stephanie Marie, Masons Travel – Mr Leonard Alvis and Mr Paul Lebon, Coral Strand Hotel and Savoy Resort & Spa – Mr Mike Tan Yan and Mrs Caroline Aguirre, Berjaya Hotels Seychelles – Ms Wendy Tan and Mrs Erica Tirant, Hilton Seychelles Hotels – Mrs Devi Pentamah. Commenting on the STB’s participation to the event, the STB Chief Executive, Mrs Sherin Francis, said the trade fair was a great opportunity to showcase the island’s product to the travel trade and the press and bring to the forth the different experiences on offer for the visitors. “IFTM Top Resa is an important trade fair. It is an excellent platform to meet with our partners from all over the country and get first-hand information as to the market situation and future trends. During the 4 days we have had the possibility to network, discuss and exchange on means and ways to continue increasing our common business,” said Mrs Francis. She continued by expressing her satisfaction with the outcome of this year’s edition of the trade fair. She said there was increased interest in the destination and that French trade partners are coming up with new ideas aimed at jointly promoting the Seychelles islands. The partners present at the event left Paris satisfied and the STB team conveyed its gratitude towards the partners who participated, hoping to see more collaboration and partnership from the Seychelles’ tourism industry at large to continue to grow the market, which already is showing great sign of improvement in terms of arrival figures. France has always been one of the leading markets for the Seychelles in terms of visitor numbers. France had sent 31479 visitors to the island nation so far in 2018, which is 8% percent above the 2017 figures for the same period. STB’s Regional Director for Europe, Mrs Bernadette Willemin, said it is important to boost Seychelles’ visibility on the market, to remain relevant and stay top of mind with the trade and the consumers. “Trade fair such as IFTM Top Resa are valuable tools for almost any type of business. It allows one to create sales leads and provide opportunity to convert interest in to a qualified lead. It is also a valuable networking opportunity with people and businesses from the industry without forgetting that it helps to create awareness about our business and our brand,” said Mrs Willemin. Seychelles has been a loyal participant of IFTM Top Resa over the years. The event is a platform that allows business-to-business meetings, negotiations and networking between French and international companies and the intermediaries for tourist products. It presents trade partners with the opportunity to understand the French market, see how the market is developing and foreseen trends.